Did you notice something different over on Twitter recently? Twitter unrolled its new, and, quite possibly, most important feature called “Moments.” Moments takes what everyone is talking about and puts it into a tidy place for the user to find. Now we don’t have to jump in and get lost, mid-conversation. This is a great way to check out and interact with what’s going on on Twitter, before you dip your toes fully into the stream. What EXACTLY is this “Moments”? Essentially, Moments makes trending stories have a longer life. It yanks it from the rapids of the Twitter river and sticks some stuff into a calm little pond, where it waits patiently to be fished out. With the click of that neat little lightning bolt icon, a list of important highlights, along with live tweets, awaits. You’ll never have to wonder what’s happening on Twitter, ever again! It’s quite simple, really. Well, no, it isn’t, but we’ll make it simple. We mentioned the lightning bolt icon already. You click it, which then brings you into the Moment app. What you see on that neat, magazine-like screen is a list of new and emerging stories that are popular in your network. If what’s going on doesn’t strike your fancy, you can click on “Sports” or “Entertainment” and catch up on what’s been going on over there. How will it affect my own Twitter stream? It’s supposed to affect your Twitter stream! Moments and your stream are new besties. They don’t go anywhere without the other. Moments tells Stream everything, and vice versa. Together, they are supposed to make a more robust, enriching, newsworthy experience. As Moments grows and learns how the user, well, uses Twitter, the content in Moments will be more individualized, tailoring itself to your own, personal likes. 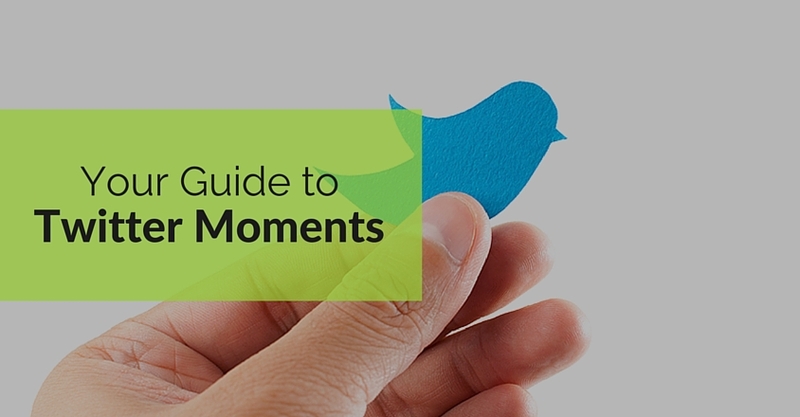 How can Moments benefit brands? Twitter is a cultural zeitgeist. As a brand on Twitter, you need to be aware – no, ahead – of the trends. Currently, we can stay on top of trends by staying really active on Twitter, checking out trending hashtags and using Twitter lists. Twitter’s new Moments feature now gives you another way to keep your finger on the pulse of the Twitter sphere. As a brand, it’s not enough to settle for not being left behind the conversation, you want to be the leader. Imagine if your content was selected to be part of the curated collection! At the moment, “Moments” (see what I did just there?) are only curated by a couple of Twitter partners but Twitter will be opening Moments up to more users in the future which, in turn, could present huge opportunities for creative thinking brands to set trends! Twitter created a game-changer with Moments. Unlike some other features that Twitter has played around with in the past, this one is going to last a lot longer than…a moment.